Acupuncture, Digitpuncture and Electroacupuncture are valid therapies, although they are useful only in certain light affections, never for serious illnesses. There are other therapies, or rather alleged therapies like Biomagnetism that are only placebo effect and they don't have any real effectiveness. Obviously, in Acupuncture, and the same thing in Digitpuncture, Electroacupuncture, Homeopathy and Reiki, where the placebo effect works as well, but it operates with a small percentage of real effectiveness only 25% – 30%. There is a problem when therapists of these alternative therapies create false expectations in the patients, for example by saying that these therapies can help the cases of cancer, diabetes or cirrhosis. This is absolutely wrong. It is also necessary to keep in mind that all these therapies are aleatory in the sense that it is easier to find a needle in a haystack than to find a good professional who gives a correct diagnosis. Interlocutor: Could we talk about Acupuncture? Interlocutor: What is Acupuncture and what is its base? Ruanel: The human being has 21 chakras that are energy centers. They are 7 well-known chakras and 14 secondary chakras. But just like the planet Earth, the human being has also nadis that are conjunctions of meridians and parallels. Every human body has them. They are grids of a millimeter thickness and at a millimeter of distance from each other; they go over the human body vertical and horizontally. Interlocutor: What does Acupuncture do, then? Ruanel: What Superior Acupuncture does, according the place it touches, is to modify the circulation of energy, and it does it through the physical part and not through aura. Interlocutor: Then, Has Acupuncture some connection with aura? Ruanel: Yes, Acupuncture has to do with aura. I will explain it better. The aura has a thickness. Although Reiki can end up touching the person, it works mainly on the aura although the hands press on the psychic centers, such as the head, the shoulders, the back, etc., but it works on the auric part. And the techniques similar to Reiki do the same thing. Now, although Acupuncture works on the aura, it works more on chakras that are in the organic part. And in the organic part -and this is real- each physical organ is connected to a center. It is also true that touching with acupuncture or electroacupuncture the hands or the ear lobes, this makes that the liver works better, the pancreas works fine, etc. What I do have to say, to not create false expectations, because otherwise I would generate karma myself, it is that although there might be a benefit of 10% and even 50%, these techniques will never be the same thing as a direct medical therapy. Ruanel: And it doesn't correct problems like metastasis and similar problems. Interlocutor: Are we always speaking always of smaller affections, then? Ruanel: Correct. For example if you have upset stomach or an indigestion, you can make Acupuncture in certain parts of the body or Reflexology on the plant of your feet which is also a kind of acupuncture, and achieve in this way that your stomach feels better that it secrets juices and therefore you have a healthier digestion. Interlocutor: What connection exists between an engram and acupuncture? For example if a person has an engram that impels him to drink. Ruanel: No, an engram cannot be corrected with none of these techniques. Interlocutor: Which means that the engramic charge has nothing to do with acupuncture? Ruanel: Of course. Acupuncture, as well as any other technique or alternative medicine correct some auric problems, others at chakra level, certain psychophysic factors , but when there are compulsions or engrams, or more serious illnesses, they cannot be corrected by any alternative therapy. Interlocutor: Is Acupuncture the same as Homeopathy and Reiki? I mean if there was a good acupuncturist who uses appropriately the needles. Concretely, Is there also a placebo effect in Acupuncture? Ruanel: Yes, there is also a placebo effect. There are therapeutic massages and I am speaking about good masseurs that press certain points or make massages so that the lymphatic circulation of a leg, arms, of the neck is corrected in the body. These massages with digitpuncture even end up hurting. So that hurts more than Acupuncture. Acupuncture doesn't hurt, but digitpuncture does. There are many people that have engrams against needles and they opt for digitpuncture, being that in fact digitpuncture is more painful. Digitpuncture can even provoke unbearable pains when they touch the nodes. Interlocutor: What is the concrete difference among Acupuncture, Electroacupuncture and Digitpuncture? Are they more or less the same thing? 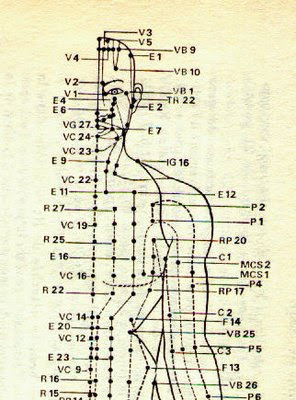 Ruanel: No, because Acupuncture and Electroacupuncture touch the chakras, and all of that is in the organic physic parts such as hepatic, renal, cardiovascular, the lymphatic, even on the sole of the feet, which is Reflexology. Digitpuncture, on the other hand, has more relation to the muscular part, mainly through massages or pressure in the muscular mass and it makes a different effect. It doesn’t work with chakras, but with the muscular mass. And after that there is even Superior Digitpuncture that works with the chakras in the part of the spine, in the coccygeal chakra or sexual chakra, where it can open it so that the person channels better the sexual part. Interlocutor: Why could not Acupuncture help an incarnated person with a real physical problem in a hand for example? Ruanel: I clarify it. If there is an organ that works badly, because it has some problems. We are not speaking about a kidney that works badly, but about a kidney that filters sand, or a kidney that filters a little. Then, with Acupuncture one can get some improvement in that kidney. But if that kidney is in a bad condition for a transplant, Acupuncture won’t help at all. In the case of a person who has a dystrophy, there is no acupuncture capable to correct that condition. I want to separate between what modifying a gastric secretion or a heart pumping means, with a real physical problem that a person has and tries to correct with acupuncture. That’s simply impossible. Interlocutor: It is clear. And what about the effectiveness? I mean in the case that a person finds a good acupuncturist and who practices very well acupuncture. Ruanel: The effectiveness would be about 25% or 30%. Interlocutor: And the placebo effect? Ruanel: It would be 70%. Ruanel: No, it is not like that. There is a 30% of real effect, and 70% of placebo effect, we are speaking of 100% Do you understand me? Ruanel: Well, but we are speaking about the cure. That is to say, if a person has a 100% of damage, and Acupuncture helps only a 10%, 3% is due to acupuncture and 7% is placebo effect. Ruanel: Then, it is a 30% and a 70% inside that 10% of healing. Interlocutor: Now I understood completely. Ruanel: I repeat it so that it is very clear: in all alternative medicine,- not only acupuncture- there is 30% of real healing and 70% of placebo effect where the person believes he/she is better and the same placebo effect is the cause of that improvement. Then we are speaking of 100%. But we are not speaking of a 100% of real healing. If the person improved a 10%, then 3% is because of acupuncture and 7% placebo effect. Therefore, we speak of a 100% inside that 10%. There is a healing of 10% only. Interlocutor: It is clear, Master. And if we find a good acupuncturist, What percentage would you give? For example 1%? Ruanel: I would say 5%. Interlocutor: Well, as I see it there are more probabilities of finding a good acupuncturist than a good homoeopath or a good reikist. This entry was posted at Saturday, November 14, 2009 and is filed under Therapies . You can follow any responses to this entry through the .